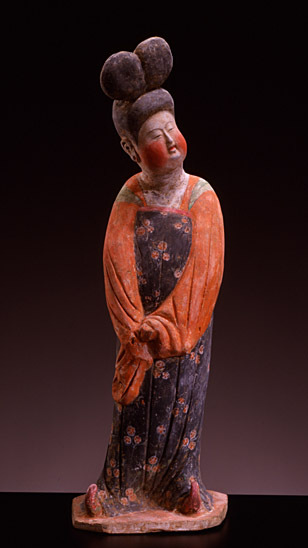 This court lady belongs to a stylistic phase characteristic of the Tang dynasty (618-907) at its peak. Moreover she has the rare privilege of having kept most of her polychrome decoration intact. Her ample silhouette is clothed in a long dark blue skirt with printed floral motifs, fastened high under the bust, and a V-necked vest with large, loose sleeves. Her blooming cheeks and arched, bayleaf-shaped eyebrows balance the impressive mass of the hairstyle. This particular stylistic group is characterized by a whole range of familiar expressions conveyed by the bowed head and position of the arms, which give these imposing figures a striking vitality. Bending gently, they display a rounded, delicately made-up face topped by an extravagant coiffure that flamboyantly accentuates the styles of the preceding periods. Cast in twin-section moulds, fired at low temperature and then painted, these mingqi, or tomb figures, were lined up in niches carved into the walls of the corridor leading to Tang tombs, and formed part of the refined decor. Under the Tang, however, an enhanced realism and expressiveness offset the loss of the magical virtues such figures had possessed since the Warring States period (475-221 BCE). One tradition attributes the vogue for more amply-endowed female figures to the preference of the emperor Xuanzong for the blossoming forms of the fair Yang Guifei. Although archeology has shown this legend to be unfounded, it was from the years 740 onwards that this type of female imagery became increasingly common. Similarities between the painted motifs on the dress in this piece and those on a votive figure at Dunhuang (dating from between 848 and 907), suggest that it may represent one of the final examples of funerary statuettes made after the death of the last of the great Tang emperors.